It’s so much more than a scrubbing tool for MDS assessments! 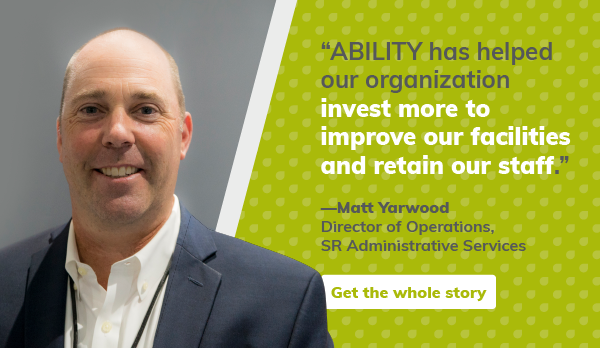 With ABILITY CAREWATCH you’ll have the right tools to simplify quality management and strengthen your business across the enterprise. “Does our documentation support the care provided? Thousands of skilled nursing facilities (SNFs) across the U.S. rely on ABILITY CAREWATCH to help them improve resident assessment data accuracy and enhance care plans via analysis of the Minimum Data Set (MDS). ABILITY CAREWATCH helps you prepare for surveys, obtain correct reimbursement, lower cost, and enhance resident quality of life. Catch MDS issues early and boost assessment accuracy. Ensure MDS integrity and accuracy through a series of logic checks that call out inconsistencies in your assessments BEFORE you submit them to CMS, allowing you to make corrections or create appropriate justification documentation. Spot risks for survey tags. Be alerted to mismatches in logic, allowing your MDS Coordinators and staff to easily identify errors for resolution. Transmit assessments directly to CMS via ABILITY | CAREWATCH; receive feedback, validation and CASPER reports all in one place. Have online access to your 802 and 672 reports along with a history of any changes made. Track, trend, and monitor Quality Measures through a series of reports and charts designed to identify where your facility stands. Monitor your 5-star quality rating status and easily compare your results with targets, including state and national levels. Monitor acute care readmissions and identify your residents most at risk.